In a statement issued Friday, Plant Pathologist at the Ministry of Agriculture, Lands and Fisheries, Kishore Ragbir, says so far the disease has reached as far as Jamaica, and if it enters Trinidad and Tobago, it would devastate the island's production of its world renowned 'fine flavoured cocoa'. The Ministry says this is because the disease is highly contagious. "The spores produced by the fungus which causes the disease - Moniliophthora roreri - can be spread naturally by wind, water or the movement of an infected pod and can survive up to nine months on a carrier such as tools, clothes, shoes, equipment, vehicles and shipping containers. Such adaptable longevity and its difficulty to control, can potentially reduce cocoa crop yields by as much as 60-80 percent." "Cognizant of this threat which continues to plague territories of both South and Central America and more recently, our Caribbean counterparts in Jamaica (since September, 2016), a national detection survey has been embarked upon on by the proactive staff of the Ministry of Agriculture, Land and Fisheries' Research Division (Plant Pathology Unit), in order to determine the presence of the disease throughout Trinidad's eight electoral Counties." 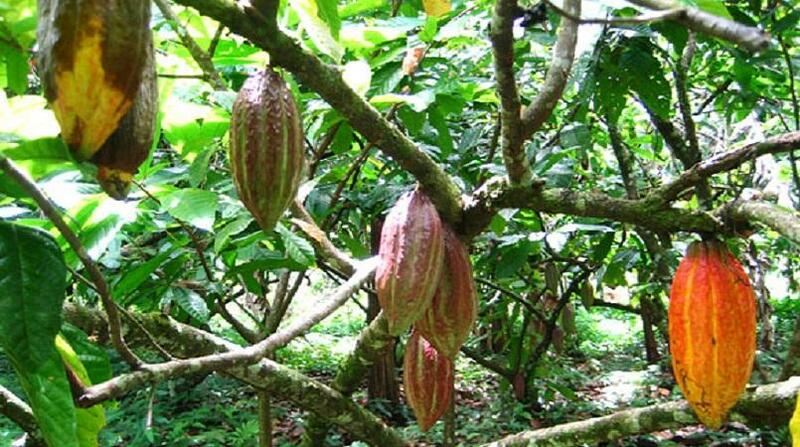 The Ministry said one such exercise occurred on Thursday March 9, 2017, at the San Juan Estate in Gran Couva which comprises some 760 acres with an average yield of "about 80,000 pounds of processed cocoa beans". Currently, the Estate exports to Japan, Germany and France. Ragbir says the detection surveillance process involves the monitoring and evaluation of cocoa pods for any signs of abnormality, premature ripening, external fungal growth and / or mummification. He explained: "In each of the eight counties in Trinidad, there are 30 farms in which 20 trees will be systematically surveyed from each of those farms, for the early detection of the disease as well as the overall management of other invasive species." Also present at the exercise was the Ministry’s Agricultural Officer I, Jeet Ramjattan, who - in his interaction with cocoa farmer and overseer of the San Juan Estate in Gran Couva, Isaiah Beesan - alluded to his Division's public awareness and sensitization initiatives. "In addition to our flyers, fact sheets and brochures, we have also embarked on both internal and external training sessions (both theoretical and practical) aimed at developing the capacity of the Ministry's staff (namely its Extension Officers) and stakeholders on the identification, reporting and treatment of the disease," he said. Persons are asked to report any suspicious Pod Rot symptoms to the Ministry of Agriculture, Land and Fisheries' Research Division at 646-6284 or via email at reportpest@gmail.com to help keep the Frosty Pod Rot out of Trinidad and Tobago. Contact can also be made directly to the Ministry's Plant Pathology Unit at 646-1645.